school can create QR code sheets per unit as their textbook. 1) Shorten url by using bit.y (https://bitly.com/). Type web address in upper right. If you accept their name or click on custom to customize your url. 2) Next go to http://createqrcode.appspot.com/, type in the URL (you can put more than one in), decide on your size, copy it. I usually save it, then copy the graphic into my document or PowerPoint. How do you use cell and smartphones to improve Modern Language learning? Free Flickr Images for common vocabulary collected by my students Blog, http://wp.me/p262R-De for full info. 1) Go to http://www.flickr.com, 2) click on the word Search, 3) click on Tags only, on the right side of the search box, 3) then enter spancon +(casa, clima, comida, deporte, descripcion, la hora, naturaleza, numeros, or trabajo- see the blog for the listing such as spancon +comida. No words, just pictures. Can be used in any language for quick vocabulary review using real objects and for speaking in short sentences. Click on Slideshow in upper right for pictures to show the pictures quickly. Improving Foreign Language Speaking Through Formative Assessment (Larchmont, NY: Eye on Education). 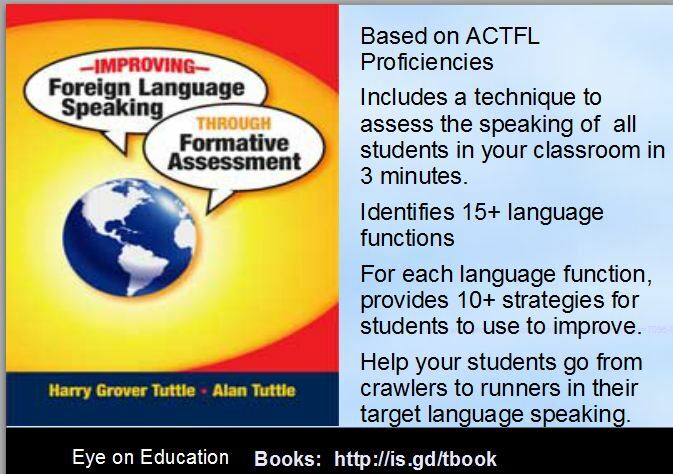 For each of fifteen language functions such as socializing, asking for and giving information, explaining, etc., my book provides ten different speaking strategies to help students to improve. Also, includes a procedure to assess all students in just three minutes. http://bit.ly/flspeakfa. Also, have a book,Formative Assessment, Responding to Students. (Am on EdTech’s “The Honor Roll: 50 Must-Read K–12 Education IT Blogs”). Am in the process of moving all modern language blogs over to this blog. In my class, I go over visualization techniques (the weirder and sexier the better according to Memory Experts such as Harry Lorayne). When we learn a new word, the students have ten seconds to connect that modern language word to the English word meaning. Once they have an image or use it an oral sentence, they review it to see if the image is hooked in. I use the image of velcro; the image or sentence has to attach the modern language word to the English meaning. We review their connection over the next few days; if they cannot remember the word, then they need a better mental connection. How do your students learn modern language words? My Spanish spontaneous speaking activities (20+) includes Modified Speed Dating (Students ask partner a question from a card-whole class), Structured Speaking (Students substitute in or select words to communicate in pairs), Role Playing (Students talk as people in pictures or drawings from 2-4 people), Speaking Mats (Can talk using a wide variety of nouns, verbs and adjectives to express their ideas- pairs or small group), Spontaneous Speaking (based on visuals or topics in pairs), and Grammar speaking games (pairs or small group). Available for a nominal fee at Teacherspayteachers: http://bit.ly/tpthtuttle.I have a series of modern language visual stories (the beach, the city, school, etc.) for two students to role play; the restaurant role play involves four students. Can use in any language since there are just visuals, no words. I originally posted this blog at my eduwithtechn site. All my modern language posts will be at this site from now on. How much do you have your students practice asking and answering questions about common world language topics? How well do your students communicate in a conversation?